Here in NW Oregon, May 1st was a perfect, warm, sunny, spring day. 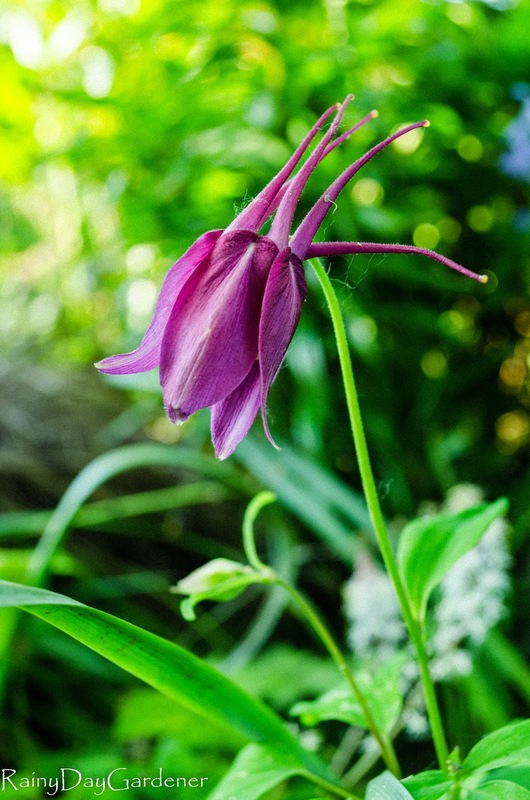 I love early May because it means the columbines (aquilegia) begin to bloom in my shade gardens. I purchased 'Black Barlow' last year from Annie's Annuals post bloom season. Wow..it's a dark beauty. I like it best when the evening light illuminates the frilly petals. I love the bold pop of color that Aquilegia 'Red Clementine' brings to a shady border. This was a gift from fellow blogger Alison, over at Bonnie Lassie. It re-seeds nicely and has given me another plant to enjoy. 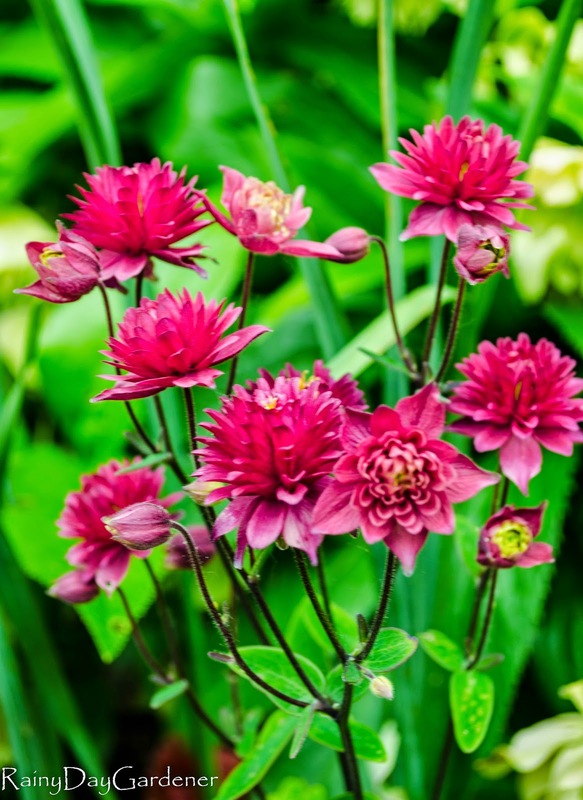 The flower heads are not your traditional shape but they are long lasting blooms. Another gift from Alison is Aquilegia 'Leprechaun Gold'. 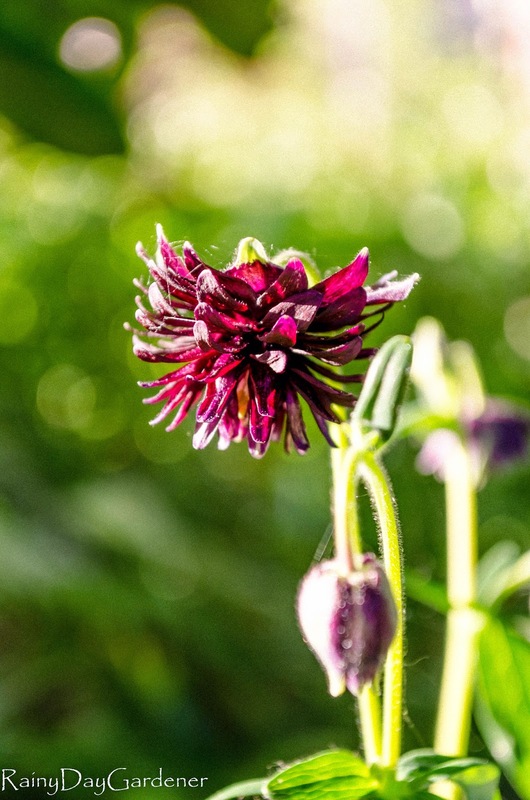 Not only is this Aquilegia prized for the stunning green and gold foliage, but the ruffled, bonnet style, purple blossoms are really cute. I've got a few pretty little self sown starts popping up, which is a wonderful bonus. Aquilegia 'Icy Blue' from Xera plants is really fascinating. The foliage is such a bold chartreuse. It's a lightening bolt of color under my snow ball tree. It starts out as a milky white blossom and it will mature into a light blue shade that I've not seen elsewhere. It is a tall plant, robust in stature. Mine have only begun to open this past week. 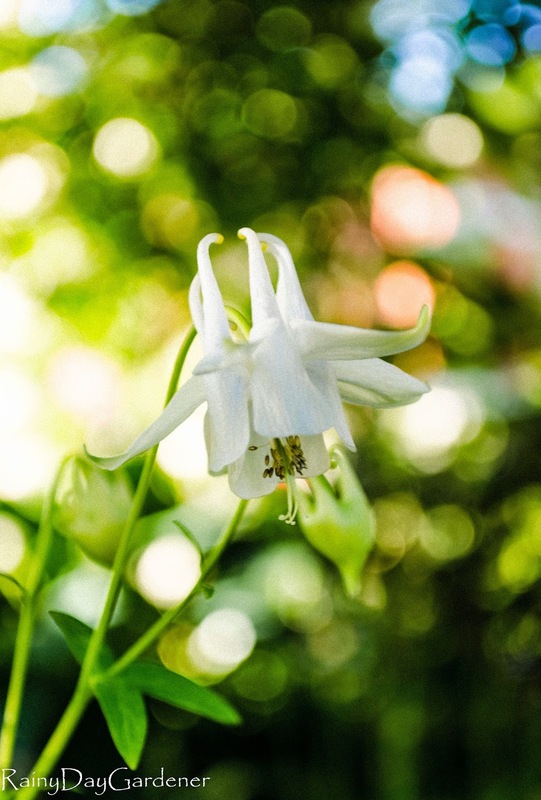 It is such fun to wander around the garden, peeping around and looking for new columbine blossoms every evening. I'll end this post with a shot of a NOID columbine. I started it from seed, along with many others and these are my favorites. Classic little blossoms in my cottage gardens. I'm excitedly waiting for the yellow ones to bloom. In my May gardens, the columbines take center stage. Ours are just in bud at the moment but hopefully they won't be long before the flowers open. I love Columbines in the May garden. Yours are already blooming, here only just buds, we have to wait. Oh my gosh, you have so many! I absolutely love them. Especially your really frilly ones. All I have is the Leprechaun Gold, new this year, and Winky Red. I should try to get some going from seed. So, so pretty. You've got some nice ones! Mine seed all over the place, but most of them are a pale pink . Last year I had a cull of all the dull ones. A few seemed to have escaped my shovel , and returned again ! Really nice to see you at the swap ! I was out there yesterday, whispering words of encouragement to the columbines' swelling buds. Yours are so pretty. Do they cross-pollinate and give you unexpected new ones? Mine have flopped in the past, so in my weeding, I l;eft a few buttercups to prop them up...hope it works. 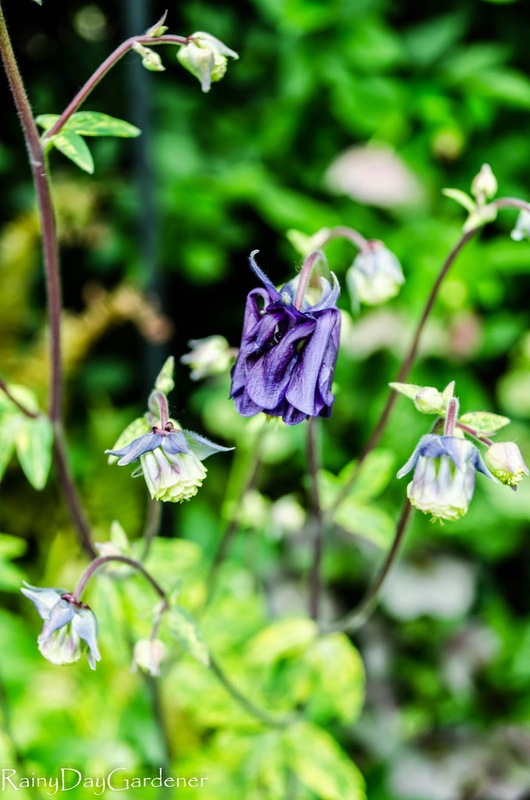 Oh my gosh Jenni, you make me yearn to see my columbines again...I do so hope that they come up, there isn't anything yet. Ack! I'm so happy I can finally FINALLY get to your blog, I've tried and tried, for some reason the comment links never went through. Red Clementine is one of my favorites. I got 'Norah Barlow' this year too and I'm loving it. Aren't they fun?